My daughter loves curry, so much so that I decided to use it to get her to eat one of her least favorite foods: squash. When she saw the roasted acorn squash, she thought I was going to use the curried chicken and rice to create a curried version of Stuffed Acorn Squash. And I was tempted to, but I noticed that when I made Stuffed Acorn Squash, one individual left a good portion of her squash uneaten. Though my daughter was not happy with my inclusion of acorn squash in the curry, she said that the curry sauce made the squash edible. What more can a mother ask for when dealing with a much disliked vegetable? The rest of the family loved it. 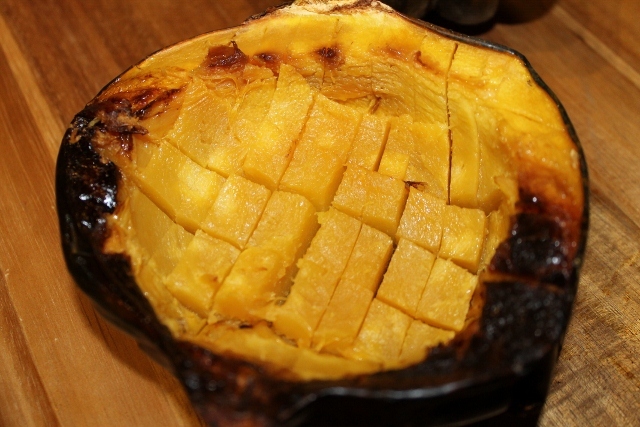 The easiest way to cut acorn squash is to roast it first. After it is cooked, cut it in the skin, then use a knife to pull the skin away, and you are left with bite size pieces of squash. Brush with oil and place cut side down on a cookie sheet. Bake the squash for 25 minutes or until fork tender. Add the rice and water to a medium sauce pan. Cook over a medium-high flame until the water begins to boil. Lower flame, place lid on pot and simmer for 20 minutes. While the squash and rice are cooking, saute the onions, peppers, and garlic in olive oil. Add the chicken, broth, and spices to the onion mixture and cook over a medium flame until the chicken is cooked through, approximately 8 – 10 minutes. Cut the cooked squash into 1 inch cubes. Add the squash and yogurt to the chicken. Cook while stirring, until the yogurt is heated through. 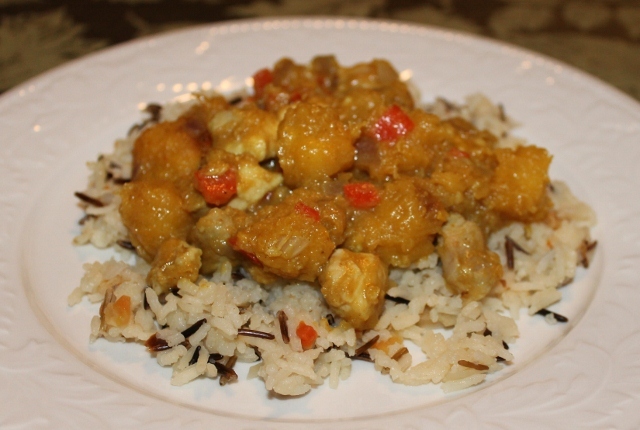 Serve the curried chicken and acorn squash over the rice.